In the post-printing decoration process of color printing for packaging, film coating and coating are the most common, and they are the most widely used processes for various printing companies. In the laminating process, there are many kinds of laminating adhesives that can be seen in the market. Compared with many advantages of water-based film adhesives, organic solvent-type film adhesives have many disadvantages, but it is strange that such products with many deadly hazards have been dying in the market. The disadvantages of organic solvent-based film adhesives are flammable, explosive, toxic, harmful to workers' health, environmental pollution, hidden fire hazards, high production energy consumption, low efficiency, and high costs. This is known to everyone, especially at present. The vast majority of organic solvents found in the market use "triphenyl"-type highly toxic organic solvents. Their harm to humans is similar to that of leukemia. It is not easy to treat, it is difficult to fully recover, and labor is lost. Premature death. That being the case, there are still many markets for organic solvent-based paper coatings. The reasons for this are many. First, the oily bridge laminating machine with organic solvent adhesive has been used for many years. The laminating machine technology is mature and the precision is high. Most of them are automatic feeding, and the mechanical price is relatively expensive. These machines are generally not easy to be damaged and the maintenance is not complicated. , so most manufacturers do not want to take this oily laminator to sell it as scrap iron, but to buy water laminating machine. Second, the organic solvent-based plastic film and film coating technology has been promoted for decades, the technology is mature, product quality is guaranteed, many companies and technical personnel do not want to replace their own skilled equipment process technology into one that they are not familiar with New process technology. Third, enterprises that supply organic solvent adhesives have cooperated with coated companies for many years and have established a good friend-type investment relationship. Both parties are reluctant to lose friends for this purpose. Fourth, many companies with oily machines have yet to find water-based adhesives that can be used on oil-based machines. In some areas, the promotion of water-based film-covered plastics is not enough. Fifth, some coated plastic products have poor quality or unstable production quality and are not suitable for high-end paper and plastic coated products such as book covers. Sixth, the price of organic solvent-based film glue is cheaper than that of some water-based film glues. Some companies do not want water-based glue. These are the reasons why organic solvent-based membranes do not hang down. However, due to the obvious problems of severe toxicity and environmental pollution and high filming costs, they have been banned from use in many enterprises or regions, so you can see that It is only a matter of time before the organic solvent glue is eventually eliminated. We manufactures all kinds of cement bulk bag, Pp Jumbo Bags, bulk bags, breathable bag, Big Bag etc. 65% of which are exported to the United States, European, Australia, Japan countries, 20% is necessary of the domestic large-scale fine chemical plant and is also the designation supplier of food factory, chemical factory, plastic factory both inland and overseas. Our excellent quality and stable after-sale services have been well recognized by our customers both home and abroad. 1. 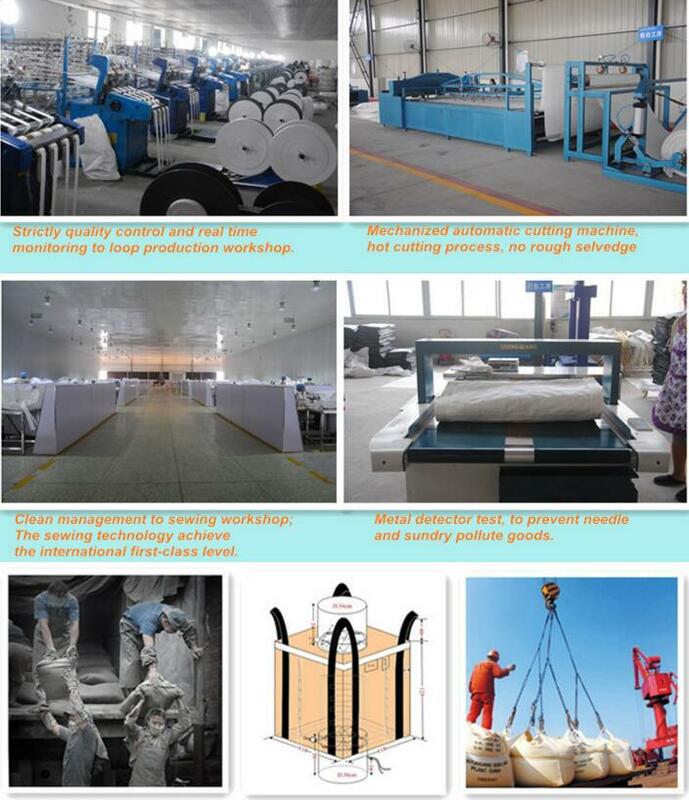 Top ten the most professional manufacturer in plastic woven industry. 2. Our experienced R&D department with many years' technology can design and produce bags under customers' requirements with competitive prices. 3. Our professional Quality Supervision department with perfect test methods can ensure good quality and steady shipment for long term cooperation. Since our company established, company adhering to the "professional, honest, mutual benefit and win to win" business idea. And it is committed to build a first-class products and services in the Flexible Intermediate Bulk Containers (FIBC) products field. Our company has good cooperative relationship with several countries in the world and won all types of industrial customers' consistent affirmation and praise. In the future our company hopes to strengthen exchanges and cooperation with domestic and foreign customers. And we take order with good reputation and reasonable price to provide customers with more satisfactory quality and services. If you're looking for a good Jumbo Bags, bulk bags and Big Bag manufacturer & Supplier. Please contact us anytime for further discussion.